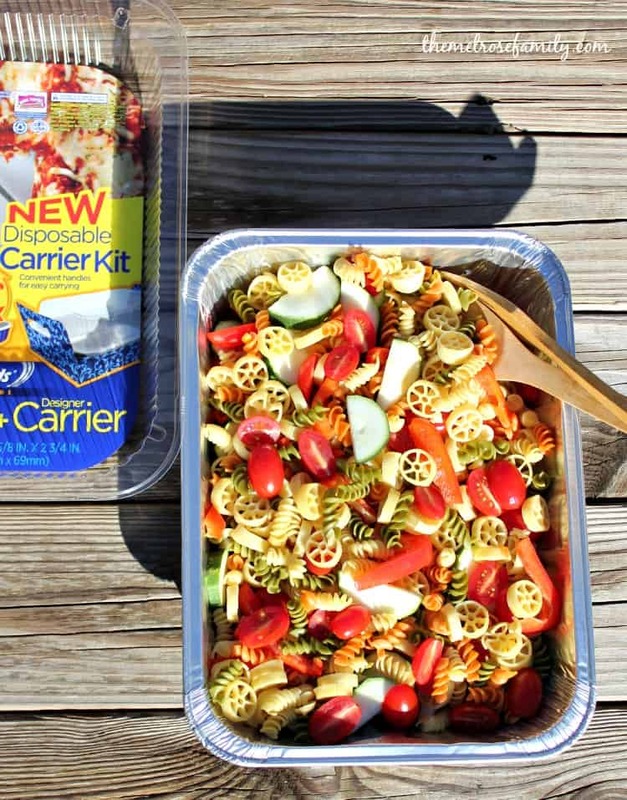 Ready for a Christmas Pasta Salad that is quick and easy? As I’ve gotten older I’ve come to realize that meals that are quick as well as easy to transport from one holiday gathering to the next is important. Our Christmas Pasta Salad is sprinkled with the colors of the holiday and the fresh vegetables of the season. Plus, it transports like a charm so it’s a win-win. In case you haven’t noticed yet, my girls love pasta and this Christmas Pasta Salad is no exception. They would eat it seven days of the week if I allowed it. 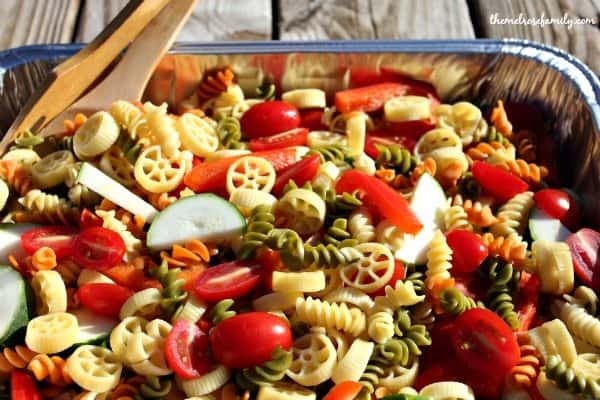 I do my best to incorporate fresh vegetables and fun pasta shapes into my Christmas Pasta Salad. 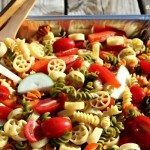 This Christmas Pasta Salad was the perfect easy lunch idea for Riley’s 6th birthday party last weekend. My favorite part about the presentation of this Christmas Pasta Salad was definitely the Reynold’s Disposable Carrier Kit. It made clean up super easy and I was able to transport it without worrying if it would spill or leak. Yes, I’m easily pleased. 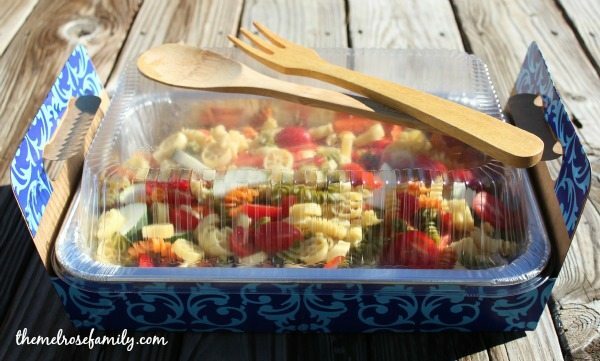 Plus, the carrying case made our Christmas Pasta Salad drop proof. Once we were done I was able to throw the top back on the tray and pop it back into the refrigerator to save for leftovers. So simple. Reynold’s is offering a coupon right now that you can grab HERE to save on every type of Reynold’s bakeware. This Christmas Pasta Salad is super easy to create and has all the colors of the holiday season. 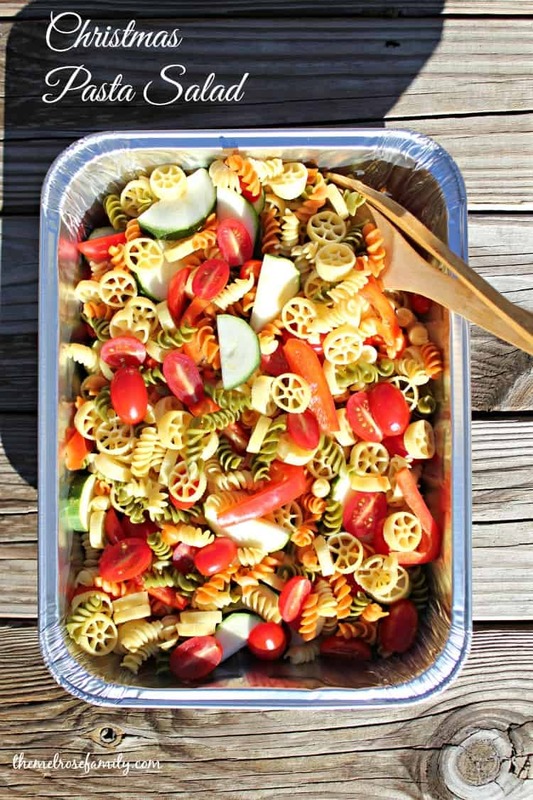 All of your guests and friends will love the freshness of this Christmas Pasta Salad. A fresh and colorful Christmas Pasta Salad. Cook both pastas according to the box instructions. Let the pasta cool and then add in the sliced vegetables. Add in the Italian dressing and mix well.